Yoga is fundamentally about returning us to our original wholeness. Reflecting this, our aim in teaching yoga is for our practice together to be a nourishing, self-sustaining, refreshing and inspiring experience. Our yoga has many influences, though our main inspiration is our teacher Donna Farhi. Donna teaches movement principles, (for example, letting the breath move you; finding a balanced relationship to the ground and gravity), which help us to explore our Self through our body. In Yoga the enquiry is to restore balance, stability, ease and sustainability in how we move and live our lives. We love teaching and sharing the beauty of the practice. Classes are at the Morra Hall, a beautiful old community hall (in the Meeting Room around the back, via the car park), a 2 minute walk away from the main village area in Oneroa, Waiheke – 115 Ocean View Road, Oneroa, Waiheke. Unless otherwise stated, all yoga classes are $17, or you may purchase an 8 class card for $120 ($15 per class), valid for 4 months. Classes are currently drop-in classes so you do not have to book your place. Please do arrive early so we can begin on time, and wear comfortable clothing that is easy to move in. If you have your own mat please bring it along, otherwise, we do have mats and props that you may use (more about yoga mats here>>). If you have any questions about Yoga classes, please feel welcome to email Neal on info@sacredmoves.com or call on 021 180 7867. Restorative Yoga invites “being” rather than “doing”, contentment rather than striving, being open rather than insensitive. While initially appearing easy, like “Lying Around”, Restorative Yoga may be seen as a more advanced form, more akin to meditation, where we have the time to observe sensations, our breath, our emotions and mind, and where we may welcome all of these experiences. We use blankets, Yoga bolsters and other props to lie over, creating optimal conditions for rest, renewal and rejuvenation. Neal regularly teaches Restorative Yoga on Waiheke and Auckland (see the workshops / retreats menu above), and is part of the core faculty for the Restorative Yoga Teacher Training at Contemporary Yoga Training. 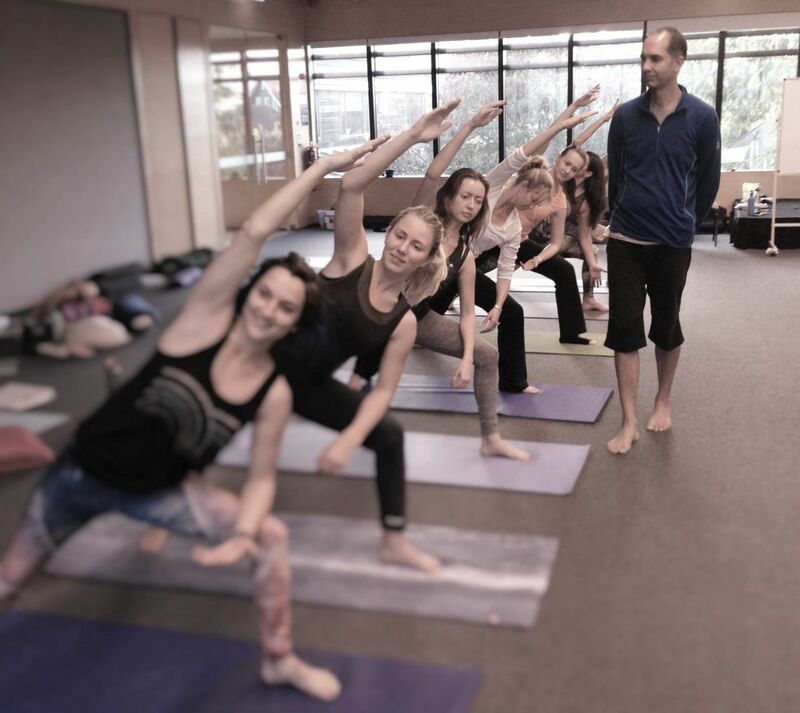 Neal is a founding member and a part of the core faculty for Yoga Alliance and Yoga New Zealand certified Yoga Teacher Training at Contemporary Yoga Training. It is my great privilege to be a part of the Contemporary Yoga Teacher Training. How wonderful to be involved with an incredibly skilled team of teachers who bring a huge range of knowledge and expertise to the course. What makes this training special is the truly holistic approach to to movement and the body, breath, mind, emotions and spirit. 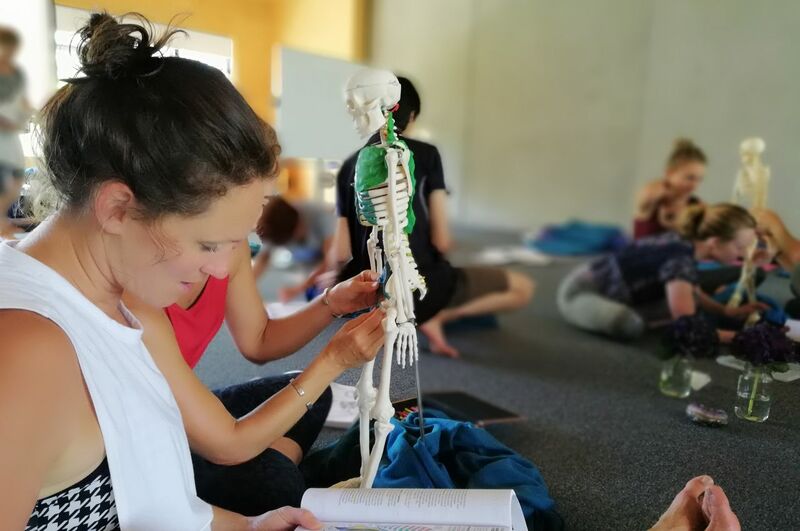 The course not only aims to guide students to become fantastic yoga teachers, it also invites them into a deep friendship with their body and breath. Through experiential anatomy and movement enquiries, by encouraging a deep fascination and curiosity about our humanity and how we develop, by discovering how yoga asana (postures) may unfold naturally, without strain, how they may be sustained with ease, and how they may dissolve with grace – we can arrive at our full conscious embodiment and find our true place here in our lives. Neal specialises in private yoga tuition, whether this is for individuals or groups. Yoga sessions are fully tailored to individual needs and requirements. Given a choice in fact, all yoga should be taught this way – every person is unique, every body is a unique body, every psychology is unique and every day is a unique day. With this in mind, we should be practicing yoga in a way which fully meets us in each day. Personal yoga sessions with Neal are geared towards helping you achieve this, so that you leave with a fluid tailored practice, one that is suited just for you and which is also responsive depending on what you wake up with each day. The goal of teaching yoga is to empower you to find your own yoga practice that supports, sustains and nourishes you in your life. To encourage you to invest in your own personal practice, we recommend that you book for three sessions – you may only need 3 sessions, although ongoing support is often useful. What happens over the three sessions? An initial assessment of how you are, your mobility, levels of comfort, state of mind and so on. Between the first and second sessions Neal formulates a yoga practice tailored to suit you. On the second session we go through the practice together. A week or two later we get together to review the tailored practice, and see how the practice has been helping you, and see if any adjustments are needed. After the third session we review again to see if ongoing support and personal tuition is suitable and desired, and we continue to develop a personal practice for you. Please contact Neal on 021 180 7867 or info@sacredmoves.com to find out more how personalised yoga tuition can help you. Both Neal and Sacha qualified as massage therapists in the UK in 1998. Neal went on to study Thai Yoga Massage in Thailand and in New Zealand and loves sharing and practicing this dynamic, effective bodywork. His approach in Thai Yoga Massage is a gentle and sensitive one, respecting the mobility and stability of each individual. Thai Yoga Massage uses assisted yoga stretches and acupressure to stimulate energy lines (like meridians), and to revitalize and balance your whole being. For this massage no oils are used and you remain fully clothed. Thai Yoga Massage has developed and assimilated influences from India, from yoga and from the Chinese healing tradition. Neal has been trained by some of the best Thai Massage Practitioners – Pichet Boonthumme in Chiang Mai, Thailand and by Asokananda, who was a pioneer in bringing Thai Massage to the west. Neal also occasionally teaches Thai Massage in mini-workshops geared towards sharing this lovely body therapy for friends and family. Contact Neal on 021 180 7867 or info@sacredmoves.com to find out more or to book a session. From my own experience as a massage therapist I know that it is not just the techniques and skills that one learns over the years that makes a good therapist – it’s the open heart, the mindfulness and presence in each moment and each breath that completes the holistic treatment. Thank you Neal for your intuitive, professional, and compassionate touch. It is such a great sensation lying on the floor, fully clothed and just being stretched and rolled and pulled in every possible way, feeling every inch of my body and it’s energy being revived, unblocked and brought into flow again. And then there were moments in the treatment when it felt like there was only one source of energy that was moving you and me at the same time. That I call mastership – when there is no separation of mind and matter. I have only felt that once with another massage practitioner. Subscribe to our newsletter for updates on classes, workshops, retreats, blog posts and more!